Today, Gerhard Muggen, Director of BTG-BTL and Empyro, passed the proverbial baton to Marc Kapteijn, Director of Twence. The parties will continue working closely together to further develop the plant and explore new sustainable initiatives. Picture above: Today at the Empyro plant in Hengelo, Gerhard Muggen, Director of BTG-BTL and Empyro, passed the proverbial baton to Marc Kapteijn, Director of Twence. Source: BTG-BTL. Marc Kapteijn also looks forward to a successful cooperation: “Twence focuses on the recovery of raw materials and the production of renewable energy. 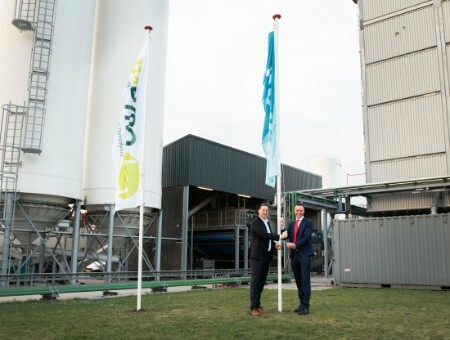 We are happy to add this unique plant, which produces the same proportion of renewable energy as the energy requirement of 8,000 households, to our portfolio. The joint development of new sustainable initiatives also provides regional strength in realising the sustainability goals. We will take great steps together to reduce the use of fossil fuels.” Twence will continue to do business on the same footing and welcomes all Empyro employees as of January.